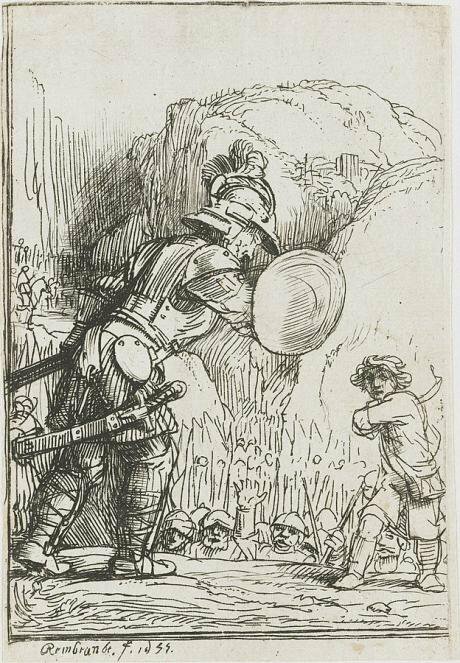 Etching on paper,'David and Goliath'- part of the series 'Four illustrations for a Spanish book' 1655. Rembrandt. Wikicommons/ Rijksmuseum Amsterdam. Some rights reserved. The title of this piece is not original, taken from George Orwell’s biographical essay, but I could not find a better one when asked by openDemocracy to write about my journey in becoming a writer. My motivations to write and their development have shifted over the years as the fortunes of my life ebbed and flowed: struggling with unemployment, personal trials, exile, alienation as well as unexpected success – all played significant roles. In this piece I will chart this development as I see it, not with the purpose of inspiring others so much as providing an insight into my struggles as an inexperienced Arab writer with its tests as well as its rewards. I first started to write for openDemocracy soon after the military coup in the summer of 2013 that ushered in one of the bloodiest crackdowns in modern Egyptian history. At the time, I was aware and fearful that the coup would involve a widespread crackdown, leading to the death of thousands and the incarceration of many more. In my social surroundings, primarily urban middle class, support for the military and its leader Abdel Fatah El Sisi was widespread, along with the encouragement of the use of widescale violence against the Muslim Brotherhood and its supporters. I was part of the minority that opposed the Muslim Brotherhood, the military coup as well as the use of violence against the Brotherhood and its supporters. I was aware that Sisi was soliciting public support for a widescale crackdown in order to polarise the polity and lay down the foundations of a popular military dictatorship. But I also knew this would be very difficult to defeat. As the events rapidly unfolded, I felt the urge and the need to speak up against what I saw as a crime. At that time an old friend of mine had just joined openDemocracy as an editor and I decided to send her two pieces I had written about events as they unfolded. These pieces were published, and my journey to becoming a writer began. At the beginning, I had no expectations of success or failure: writing was primarily an exercise in self-expression and the extension of a part of myself into the world, similar to how an artist creates a piece of music. As I continued to write and my style and thought matured, my love for the process of writing, researching, and creating something, also grew. Writing became a passion in and of itself. Every time a new piece was published, I felt a sense of exhilaration, anticipation and excitement to see what impact the piece would have. I was also supported by my professor from Cambridge, George Joffé, who made a point of instilling in me a sense of importance in what I was doing. I was not writing for immediate impact. I was ‘bearing witness’ to historical events, which many will try to re-write, forget or alter in the future. This thought has kept me going when situations became bleak and the hurdles seemed unsurmountable. During the first two years of writing, I felt that I was working in a vacuum. I kept producing pieces on a consistent basis with little feedback from a wider audience. I was not aware who was reading my pieces and if my writing had any impact. However, as time passed some readers started to contact me and I also began to receive media requests, which was very surprising at the time, because I still saw myself as an amateur in Egyptian politics. One of the readers who contacted me was Yezid Sayigh, a former Professor at the University of Cambridge, and the author of the definitive work on the Palestinian armed struggle – currently a senior fellow in Carnegie. After a few emails, he was kind enough to invite me to start writing for Carnegie, which I did in the summer of 2015. Now, in addition to being a columnist for openDemocracy, I also became a writer for Sada, Carnegie’s online journal for the Middle East Program. And I have appeared on a number of media channels, including Al Jazeera, as a guest and commentator on Egyptian politics. In addition, as part of openDemocracy’s Middle East Forum (a training programme for young aspiring writers and journalists), I got to interact and share my experience with other young Egyptian writers. Through the discussions and workshops, I had the opportunity to share and develop my ideas, which resulted in my most successful piece to date: “The Art of War in Egypt”, the most widely read piece in Sada’s archive. Though my writing career has gone further than I ever imagined, it has come at a high personal price, namely life in exile. As the crackdown continued in Egypt, it became apparent that returning home carried massive risks. The watershed moment came with the torture and murder of Giulio Regeni, the Cambridge PhD student who was conducting field research on the Egyptian labour movement. Exile, a condition of constant alienation, has not only affected me, but also my family, making it more difficult to meet and see each other. It has created a sense of loneliness and homesickness as I face the tribulations of life, more or less, on my own. A heavy price to pay and a challenge for Arab writers, journalists and intellectuals, as they attempt to tackle autocratic regimes – a David and Goliath scenario. However, David has no choice but to carry on, in the hopes that many of his fellows will eventually join the intellectual struggle against autocracy, violence, and torture, paving the way to what I see as a historical necessity: the flourishing of democracy in the Middle East and the end of the age of tyrants, not by the sword, but by the pen!